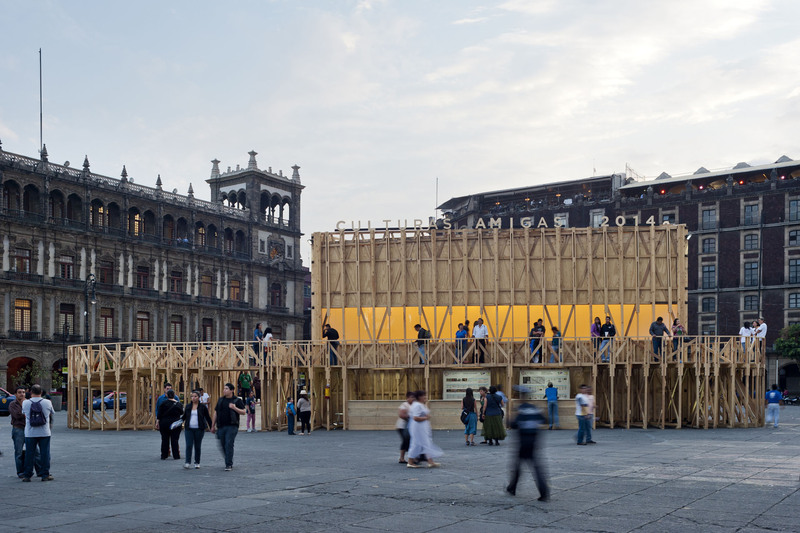 The Pavilion that represents Mexico City on the Culture Fair 2014, addresses the migrations that have influenced the development of Mexico City. 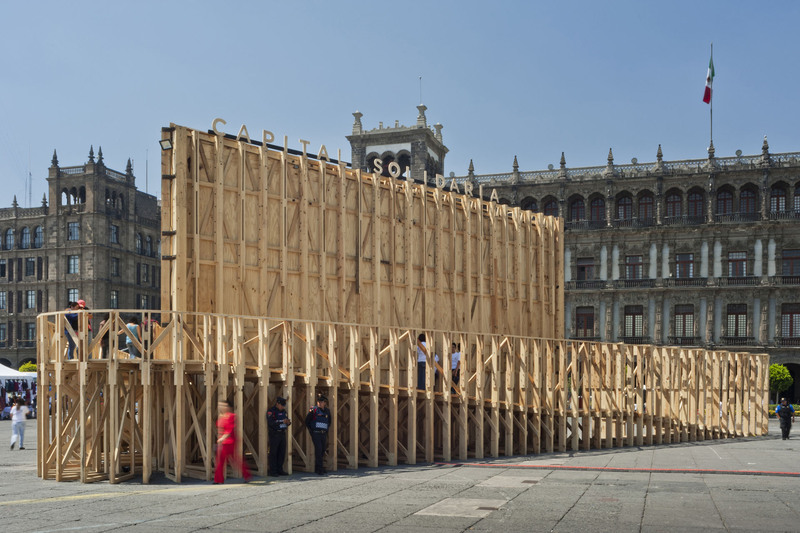 The architectonical expression of these migration flows is represented through a large boardwalk that brings visitors up to a balcony overlooking the main square (Zocalo) and that comes down again to stage a symbolical arrival to the center of the city. 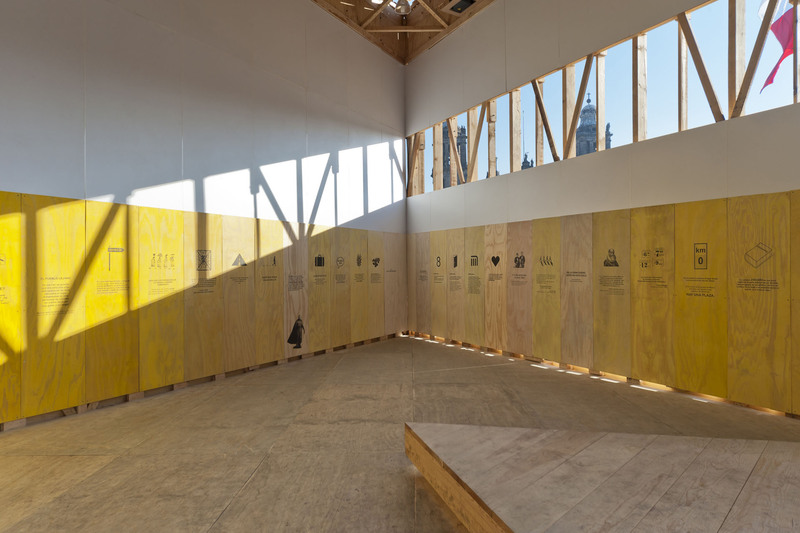 This game of straight and curved ramps, balconies and walkways, wraps around an equilateral triangle that houses a multi-use space with a graphic exhibition curated by Alberto Odériz. 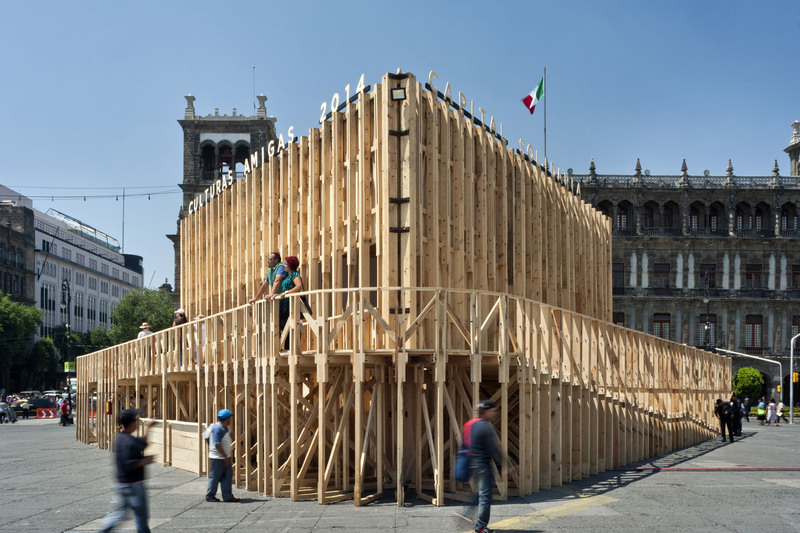 As a reference to the ships that brought the first migrants to Mexico, the whole pavilion is made out of wood. 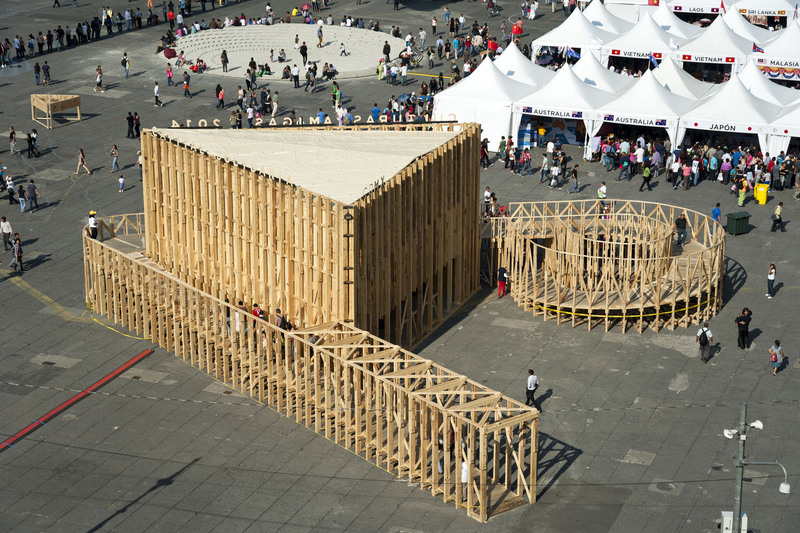 In order to reduce overall costs, all wooden elements were sold and re-used for formwork construction when the fair was over and the pavilion was dismantled. 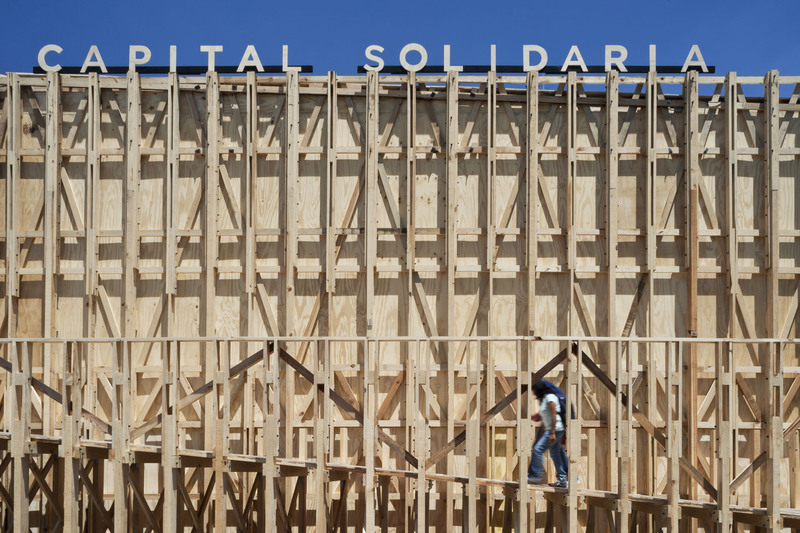 In a close collaboration with our structural engineers (Veronica Correa of KALTIA) and our contractor (Fermin Espinoza – FACTOR EFICIENCIA) we designed this almost 25 feet high structure, so that smaller elements could be pre-fabricated off site and then assembled on the public square in the minimum construction time of 7 working days. 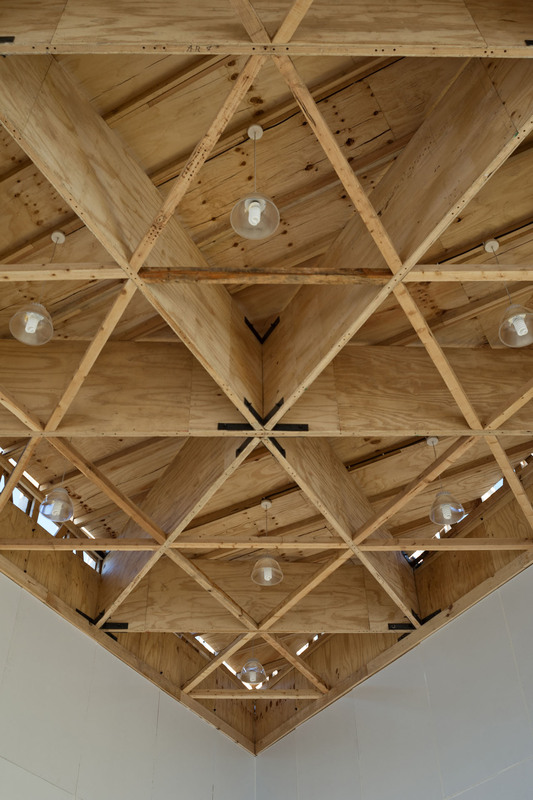 The column-less interior space (an equilateral triangle with 50 ft long sides) is covered by a large roof composed out of smaller triangular segments which lead the vertical forces down to the structural facades. These load bearing facades are designed in such a way that different rhythms of diagonal bracing, open and closed surfaces and vertical elements all come together in a very lively textured expression. The resulting play in depth of the wooden members recalls a crafty texture as if it were from a woven basket. 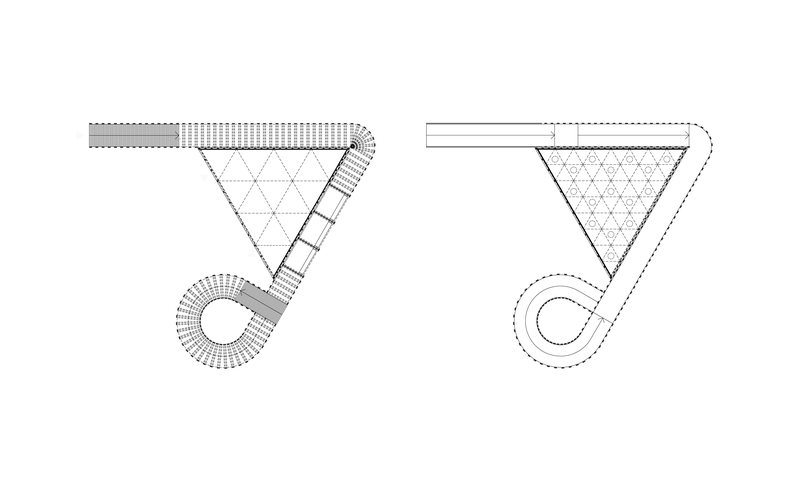 The surrounding circulation – with its straight upward ramp at the beginning, an elevated boardwalk in the middle and a circular spiral downwards to the plaza, wraps around the triangular volume, leaving one side open to organize the main access to the interior space. 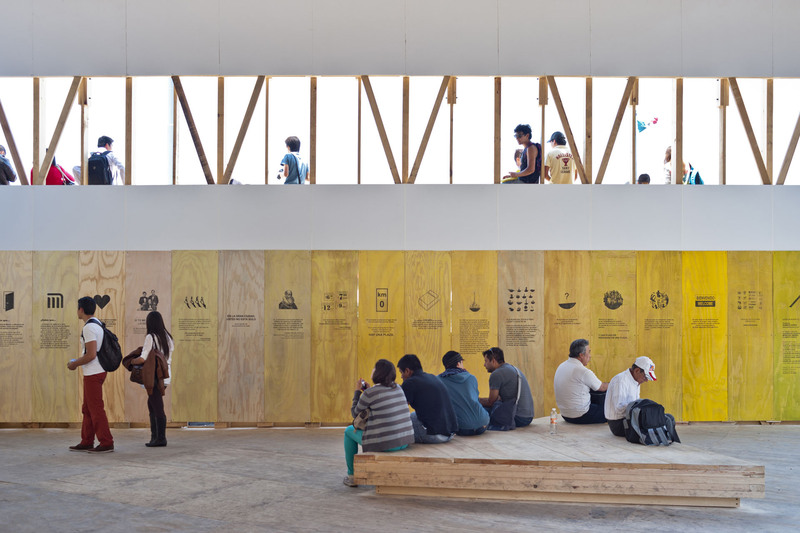 Under the elevated boardwalk a space is provided for an information counter that informs visitors about the fair. Regarding the visitors experience of the pavilion we had to take two very different functions into account. First of all we wanted to create a smaller and more intimate space in which people could dwell for a longer while, have a one-on-one relation to an exhibition narrative, enjoy lectures, assist to cocktail parties or music events. The interior of the triangle is therefore only open on just side, to control the access and occupancy in an easy way. 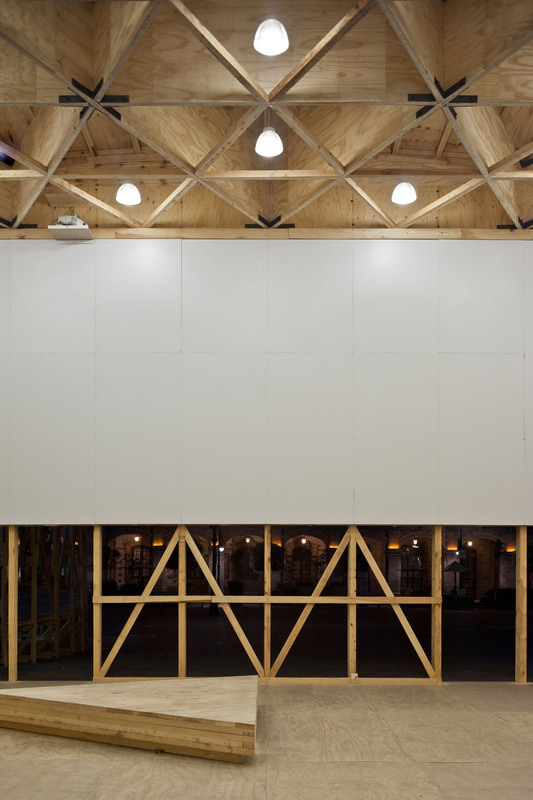 It is covered with stained and white panels to allow projections on its interior surfaces at night. On the other hand, we had to accommodate the enormous amount of people that assist yearly to the Culture Fair (that year 2014 the fair received more then 2 million visitors). 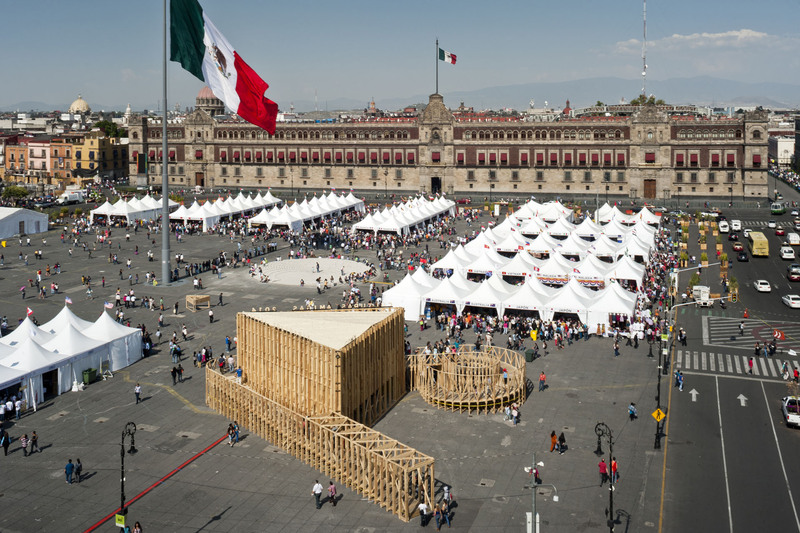 Since we wanted to create an architectural proposal that could be enjoyed by large masses without having to wait in long lines under the hot Mexican sun, we designed a fast-track route that could allow you to experience the pavilion in a different way. 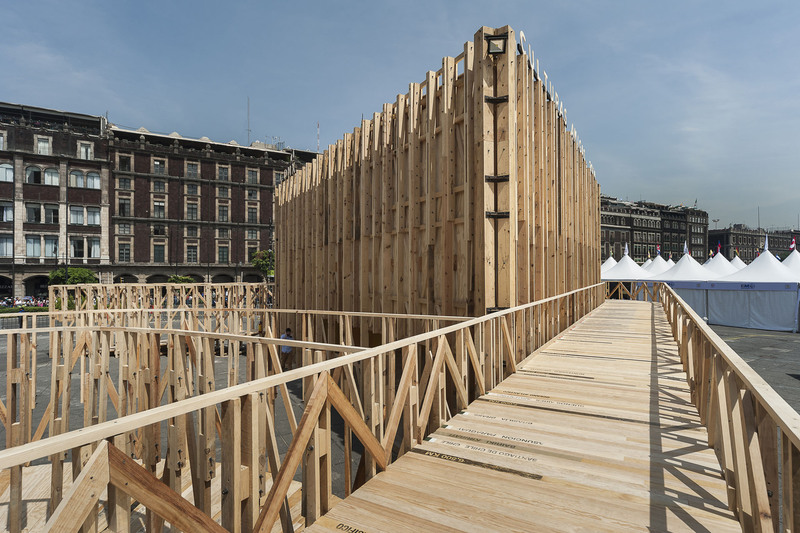 A long architectural promenade would take you up to an elevated boardwalk from where visitors could enjoy a different perspective of the cultural fair, the square, the cathedral and the presidential palace… as well as taking a peep into the triangular exhibition and event space from above. The formal and volumetric definition of the pavilion is thus almost a literal translation of these two different routes, experiences and time frames. The circulation narrates a story about migration and allows both an intimate as well as a quick experience for visitors. 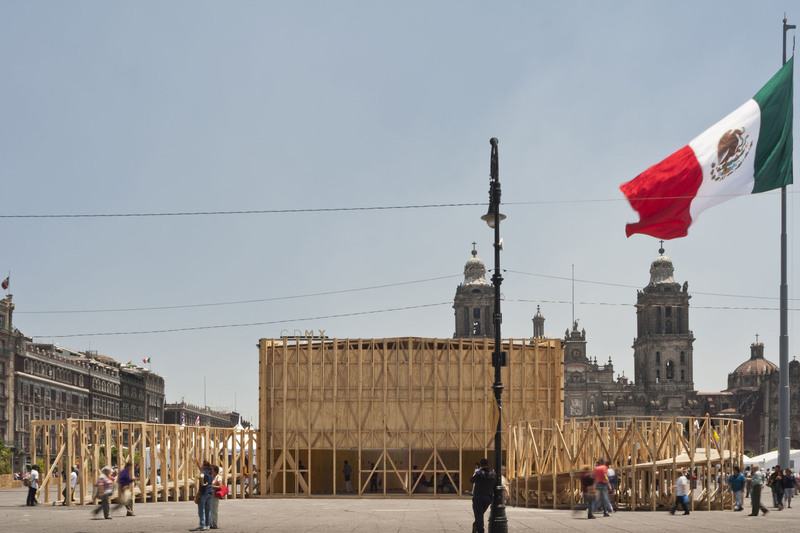 Architecture: PRODUCTORA (Carlos Bedoya, Víctor Jaime, Wonne Ickx, Abel Perles) | Collaborators: Diego Escamilla, Lucrecia Sodo, Gerardo Aguilar | Contractor: Factor Eficiencia (Fermín Espinoza) | Structural Engineering: KALTIA | Museography: Alberto Odériz | Photography: Luis Gallardo – LGM Studio | Location: Zocalo, Mexico City | Type: Temporary Pavilion | Build surface: 90m2 covered (triangle), 150m2 (boardwalk) | Date: Mayo 2014 (from May 17 to June 1) | An initiative from the ‘Coordinación de Asuntos Internacionales GDF’ (Tatiana Alcázar) for the Culture Fair 2014 – CDMX | Support by MASISA and PIRWI.